Croughton Cemetery is located on Brackley Road and is maintained by the Parish Council. 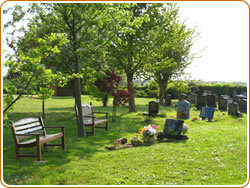 Improvements were made at the cemetery in 2005 when the Council installed an improved access road, a new gate and fencing and Councillors trimmed back and cleared overgrown trees and shrubs. In order to ensure that the cemetery is attractive overall, the Council has implemented rules for individual plots. Burials are allotted a full size grave on which a headstone may be erected. Internment of ashes are assigned a small plot on which a small flagstone may be placed. The type and size of headstone or flagstone has to be approved by the Council prior to installation. No bricks or edging stones may be placed around plots as this makes it difficult for the grass to be cut.